My name is Isabella Benavente and I am a sophomore in the AICE program at Jupiter High School. I have participated in high performance training and competitive soccer since 2011. I am a strong forward player with great composure and the ability to take players on in the final third. My strengths include the ability to keep the ball and create goal scoring opportunities. I have extremely good individual technique. I am able to use both my right and left foot. I have an excellent understanding of the game and a high soccer IQ. I have an upbeat and positive attitude and an outstanding work ethic. I have precision focus on achieving my goal of playing high level university soccer. Isabella is a 2020 player who has great height and technical skills. Isabella uses her size to win balls in the air and to finish. She usually plays the #11 and is a natural lefty. 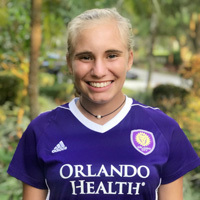 She currently plays for FC Florida Elite in National League and OCYS on their ECNL roster. Isabella trains privately to improve and loves playing.